A Backyard Dream: A Patch of Dead Grass to a Freshwater Pond! You’ve seen unusual, yet awesome backyards before. Yes, you’ve heard about people putting golf putting greens in their yard, families building backyard ice skating rinks for the winter months and big, extravagant play structures. But what one Switzerland family did might top them all, as they worked over the course of many months to turn an otherwise bland backyard into a water oasis. For many people, when they invest in something it’s only natural for them to want to make it their own and take a greater sense of pride in their ownership. This is especially the case with homes, both when it comes to the interior and the exterior. Part of owning a home is landscaping and arranging the front and backyards as you see fit. This was recently the case for a Switzerland-based Imgur user, VonBubenberg. VonBubenberg wanted to build a swimming pool/pond in his backyard and he had the perfect space to do it alongside his home. But it was going to be an extensive project that would cost thousands of U.S. dollars and include months and months of hard work. It started with a patch of dead grass and dirt. VonBubenberg didn’t want just some old run-of-the-mill pool – he wanted a unique pool. So he came up with a plan to build a freshwater pond/pool with an on-site filtration system. Undeterred by the online criticism he was facing, VonBubenberg started by chalking out the area where he wanted to put the pool – a critical first step in any project. While the yard was somewhat of an eyesore, it had potential. The pool was chalked out adjacent to a sunroom off the back of the house and a privacy fence bordered it from the one side. A chain link fence was in the rear, but that was all part of the plan in the backyard’s transformation. First things first, VonBubenberg needed to dig a hole for where the pool would go in the yard. He hired out an excavator to handle this task. It was one of the only things that he had to hire a contractor for. The black chalked area is intended to be the deepest area of the pool, while inside the white chalk will be a shallow area. As you can see, the excavator made digging the pool hole a lot easier. It sure beats using a shovel and doing it by hand. The excavator removed the dirt, while the tractor-trailer hauled it away. A water conduit was installed to help create the freshwater pond. The conduit, which you can see off to the side, helps bring in continuous fresh water from an on-site filtration system. In this project’s case, the filtration system is located in the garage. More on that later. Everyone helped VonBubenberg with the project, and the work actually became great for family bonding. Working toward a common goal tends to do that for you. The final hole has a few different depths to it. The deeper area of the hole was required to be dug out by hand, as the excavator couldn’t complete the layers. Aside from the deeper hole, you can see what appears to be a wading area off to the left and around the perimeter. What did VonBubenberg have in store? The Reddit user who called VonBubenberg “cheap” was looking to be more in the wrong. Just check out the stone steps leading into the pool on the far side – quite a neat detail that adds some great ambiance to the project. The project was coming along nicely. Next up was the laying and securing of the felt, which provided the base of where the water would eventually be. First came felt, now comes the liner. 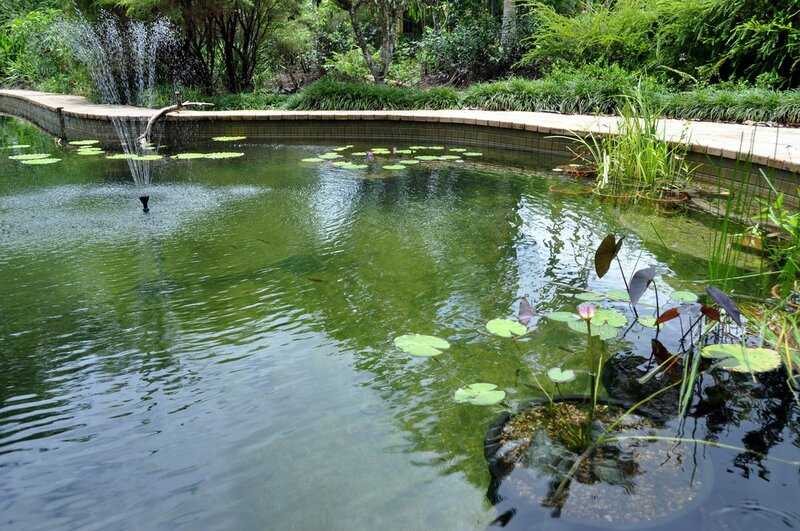 A freshwater pond/pool needs a continuous flow of water to keep it working. The fountain was already installed in the pool and the hoses led to the on-site filtration system, located in the garage. To make the pond look great and help support it structurally, rocks were brought in to form the deep part of it. While this was the most intense part of the project – taking five men eight hours to complete – the payoff was extraordinary. There were no corners being cut with this project. Now that the rock walls were done, there needed to be some sort of a base. For this, floor tiles were placed on the bottom of the pond. With the rock walls and floor tiles placed, rock and gravel was spread out around the perimeter of the pond. Water would still fill in this part, but it would be much more shallow – a true wading area. Finally, it was time to add water to the pool. A hose was placed into the deep area and it began to fill up. It wasn’t long before water filled all parts of the pool – both deep and shallow. The project was almost done! While a privacy fence and sunroom were adjacent to the pond on two sides, an ugly chain link fence bordered it on the other. But if you take a peek at this photo, that fence was replaced with another nice privacy fence with shrubs planted around the border. Though not finished yet, we can’t help but want to jump in for a swim by the looks of it. When we say that all the stops were pulled out for this project, we mean it. Look no further than the awesome underwater lighting for swimming after dark. What a great touch for hosting parties and evening gatherings! The project spanned several seasons, so it wasn’t long before the pond froze due to cold winter temperatures. The project was halted until the spring thaw as a result. And while the pond is intended to be used for recreational purposes in warm weather months, that’s not to say you can’t take up a game of shinny hockey when it freezes over! If you can’t work on it, why not? Though the pond/pool was now pretty much complete, the backyard was not. And when spring came, work resumed on the final steps of the project. What the backyard really needed to complete its magical transformation was none other than an awesome deck overlooking the pond. This was designed to come off of the sunroom. As you can see, the deck was going to be built right up against the pond. Gravel was placed underneath the deck. Then supports were positioned and the timber was placed. The deck was designed to wrap around the pond. As you can see, the deck didn’t stop just off of the sunroom – it wrapped around three-quarters of the whole pond! What a cool idea. The backyard went from a dead patch of grass into paradise. With a full, tiered wraparound deck, it’s great for hosting parties and barbecues. And, of course, you can swim too. Despite the heat that VonBubenberg took online when news of his plan hit the Internet, you can see that the final project is far from “cheap.” A better term might be “paradise.” It just goes to show what you can do when there’s a desire to do it. In fact, the pond/pool was estimated to have cost about $34,000 U.S. to complete. The average cost of a standard in-ground pool runs around $22,000 U.S. While the Internet trolls were out in full force at the start of the project, they were silenced at the end of it.